As we viewers meditate upon this luminous, sensory painting, we are instantly transported into the warm, blinding rays of the afternoon sun. We can feel the salty sea breezes, hear the slap of water against the boats, the calling of scavenging seabirds, and the shouts of the fishermen to one another as they rein their boats in against the tide. The washed out, sun-bleached look of the women’s clothing gives off the impression that standing in the bright, reflective light together to tally up the day’s catch of fish is likely a daily chore for their group – they are no strangers to this task. At first glance, this scene appears to be a lighthearted depiction of a seaside community, but if we take a deeper look, we can see how the small, shadowy subtleties in this painting hint at a much darker reality for these diligent fisherwomen. The artist responsible for creating this vibrant scene is Joaquin Sorolla, an oil painter who truly excelled in the style of Impressionism. He painted Fisherwomen On the Beach in 1903 in his native land of Valencia, Spain, and this piece is a prime example of his ability to render scenes containing people and landscapes in both brilliant, high contrast color and soft, shadowy pastels. Sorolla possessed a rare ability to simultaneously look above the surface to fully understand the lighter colors and layers needed to mimic the complicated appearance of dancing sunlight and also look beneath the surface of a scene to reproduce its darker subtleties. The tiny details in the boats, the reflective ripples in the water, and the wrinkles in the women’s skirts are all things that are almost unnoticeable at first glance, but are crucial factors that create the compelling visual depth and emotional contrast that exists in this painting. If we consider more deeply the aforementioned shadowy details that lie underneath the sunlight, we realize that although this scene looks tranquil and quaint upon first glance, in reality the toil of these women is both tedious and dangerous. They count the catch with somber expressions as the single fisherman who supervises them looks on impatiently. The blustery wind, the endless baskets of slippery, stinking fish, the crashing waves that create a cold, damp spray onto the workers – this is a raw & thankless job. Living off the sea is an unreliable, challenging existence, full of never-ending excursions that often return fruitless. This piece is a sobering reminder for us to continually stay aware of our surroundings, look beneath the surface, and have compassion for the struggles of others, even if we do not fully understand the reality of their situation. We realize that although this scene looks tranquil and quaint upon first glance, in reality the toil of these women is both tedious and dangerous. Your use of incredible detail in this analysis provides such an in depth sneak-peek into the imaginary realm you have created for the women in this painting. 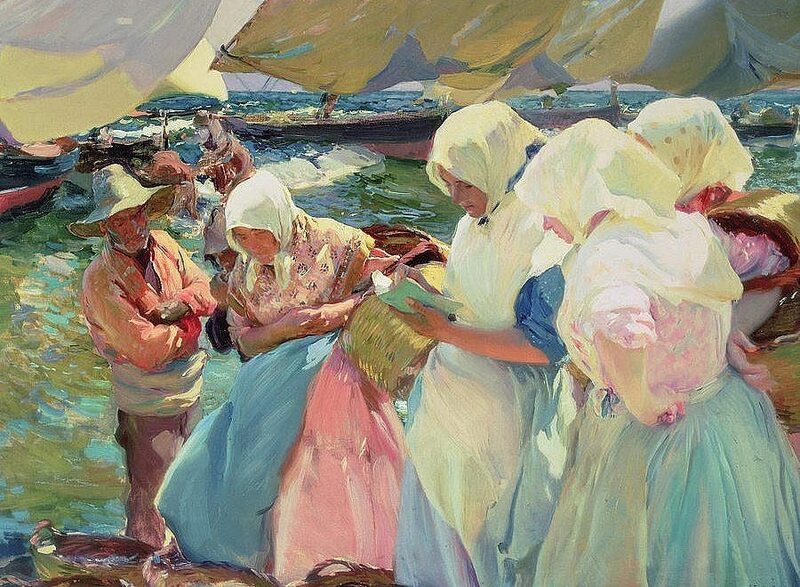 I also enjoy Sorolla’s use of pastel colors, accompanied with darker hues (to signify the presence of something dark and sinister) in the image! What are your thoughts on the woman in the center of the piece reading what appears to be some sort of notebook? Thank you so much, Bonnie! If you look closely at the woman with the notebook, she is holding a little pencil in her right hand – i’m thinking that she’s making records of how many fish there are, what type, etc. I agree with the writer on the last sentence. Look at the way the book is held, tenderly. It makes me think that she is reading the page on the left comparing today’s catch with that of yesterday’s. At the exact moment when the second lady to her right (with her left hand on her hip) murmuring to our first one, “Today’s catch looks better”. To which our lady checks the price of the catch that went yesterday and says sombrely, ‘we don’t know that yet’; what with the supervisor looking on…Oh, the page on the right is a blank one and we will never know what happened the day after.